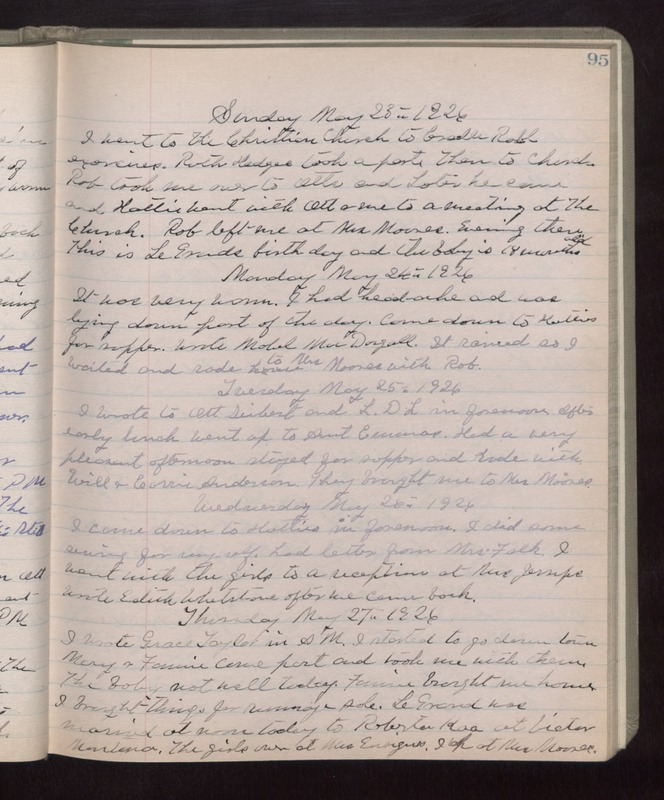 Sunday May 23rd 1926 I went to The Christian Church to Cradle Robe exercises. Ruth Hedges took a part. Then to church. Rob took me over to Otts and Later he came and Hattie went with Ott & me to a meeting at The Church. Rob left me at Mrs Moores. Evening there. This is LeGrands birthday and the baby is 18 months old. Monday May 24th 1926 It was very warm. I had head-ache and was lying down part of the day. Come down to Hatties for supper. Wrote Mable MacDougall. It rained so I waited and rode to Mrs Moores with Rob. Tuesday May 25th 1926 I wrote to Ott Seibert and L D L in forenoon. After early lunch went up to Aunt Emmons. Had a very pleasant afternoon. Stayed for supper and rode with Will & Carrie Anderson. They brought me to Mrs Moores. Wednesday May 26th 1926 I came down to Hattie in forenoon. I did some sewing for myself. had letter from Mrs Falk. I went with the girls to a reception at Mrs Jessups. Wrote Edith Whetstone after we came back. Thursday May 27th 1926 I wrote Grace Taylor in AM. I started to go down town. Mary & Fannie came past and took me with them. The baby not well today. Fannie brought me home. I brought things for rummage sale. LeGrand was married at noon today to Roberta Kra at Victor Montana. The girls over at Mrs Ensigns. I up at Mrs Moores.